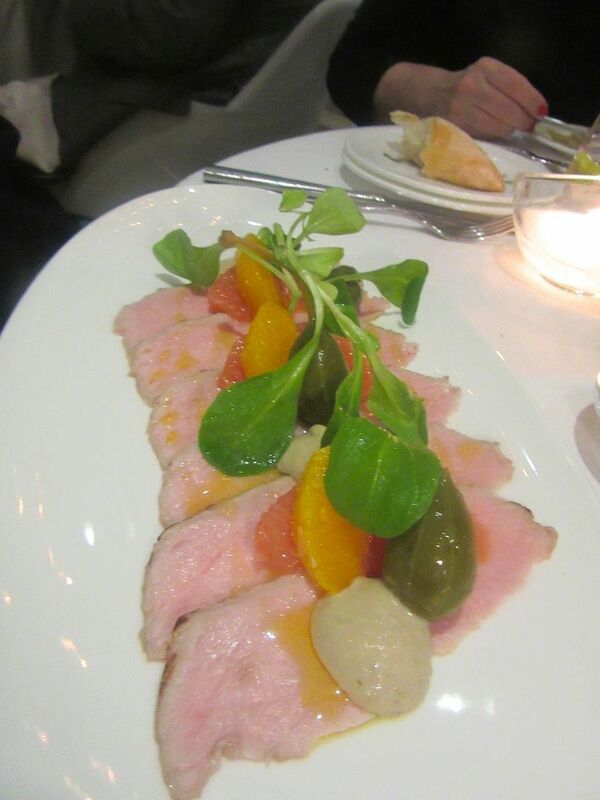 The perfect summer dish: Vitello tonnato with Pantelleria capers and the tuna sauce alongside. 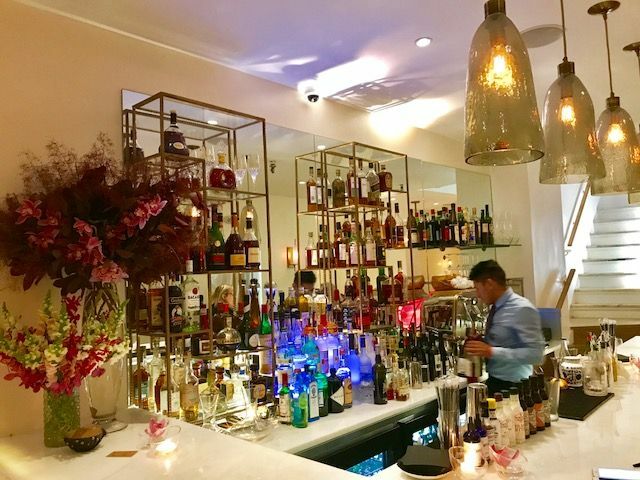 “It’s very good and it hasn’t been written about yet,” my friend Bob says, recommending Avena, a new restaurant on East 57th Street. No way I would resist. I welcome the challenge of staying ahead of the print restaurant critics. Remember? I used to be one myself. Avena’s simple, narrow duplex offers eating at the bar and pink Edison lights to flatter. It turns out to be a great tip. Five of us, crowded around a small tablecloth-draped round in the lower level of this narrow townhouse, agree. Pricey, maybe, but very good and pretty with a cosmetic pink glow from Edison bulbs and an orchid in a small glass on every table. 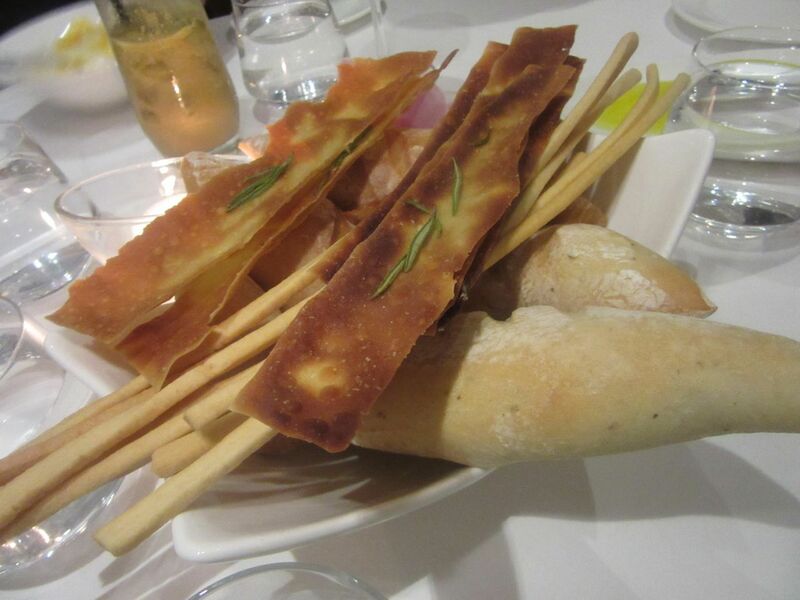 Hosts Roberto and Giselle Deiaco offer a generous bread basket with Laudemio olive oil for dipping. We’ve ordered $16 cocktails. They take a long while to arrive, so the ambitious bread basket is the first good news. Olive oil-smeared crisps, bread sticks, just-baked rolls still warm from the oven. And separately on a plate, a puddle of Laudemio olive oil with a small float of Balsamic for dipping. 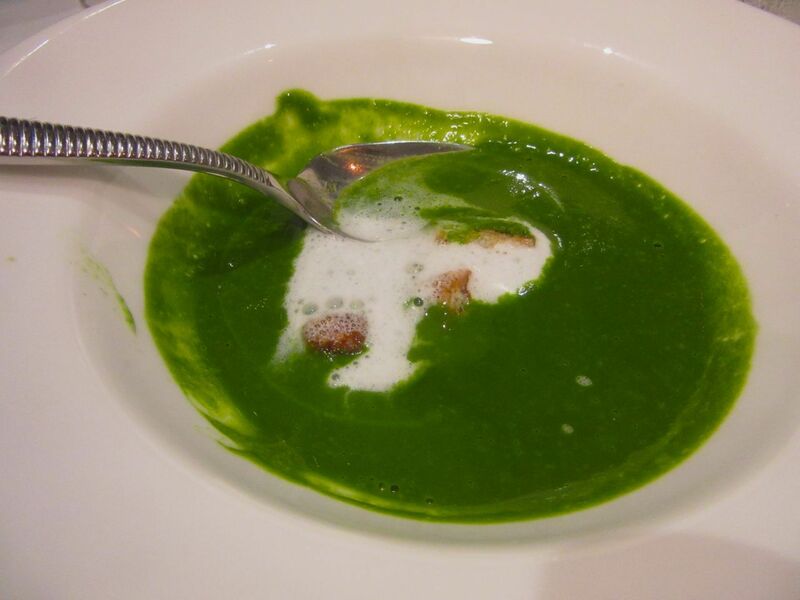 The zuppe amuse comes in a big bowl, not a doll’s cup. It might be gazpacho with burrata or Swiss chard. The second positive tell is the welcoming amuse of soup, not in a dollhouse-sized espresso cup, but poured into a generous bowl: yellow tomato gazpaccino with burrata one evening, Swiss chard with milk foam on another. I notice we’re all spooning up the last drop. 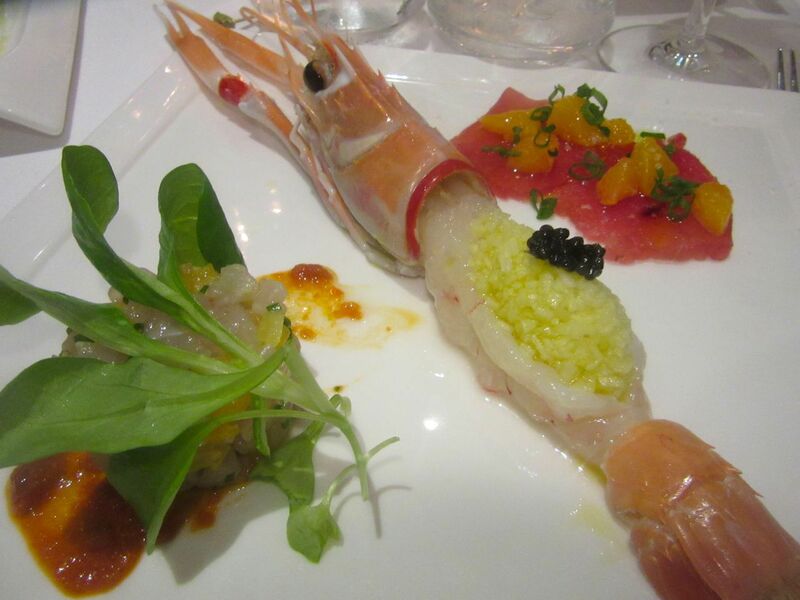 The crudo di mare trio includes Big Eye tuna, branzino tartare over oliveta and langoustine topped with apple. With a mixed expression of welcome and embarrassment (or is it shyness? ), owner Giselle Deiaco, descends the stairs from the duplex dining room above to belatedly take our order. Actually, belatedly is the order of the day at Avena. Most of the servers seem hesitant and confused, and it feels like chef-padrone Roberto Deiaco could use some help in the kitchen. Dinner is already dragging when the kitchen sends a gift platter of langostine on mushrooms and a raviolo. This wildly rich ricotta-and-quail-egg-filled pasta package paved with truffle chases away any moodiness. True, the sensational middle course sent as a gift on my second visit probably throws a wrench into the timing of dinner. I moan when it hits the table. We’ve already waited a long while for entrees. I attack the giant langoustine, so exquisitely rare, on a luxuriant mushroom puddle. 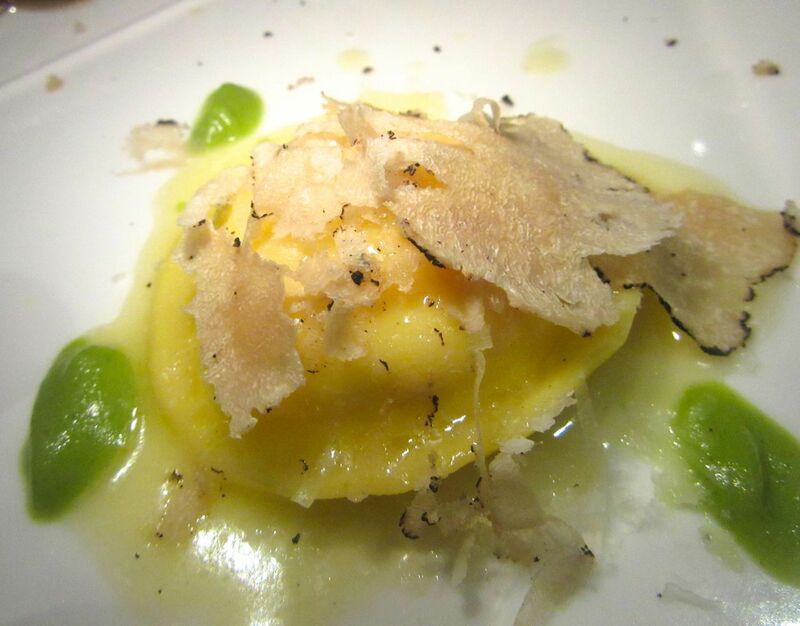 And then I focus on the sensuous raviolo, filled with ricotta and a quail egg yolk, paved with thin slices of fresh Norcia truffles. Killer bites. 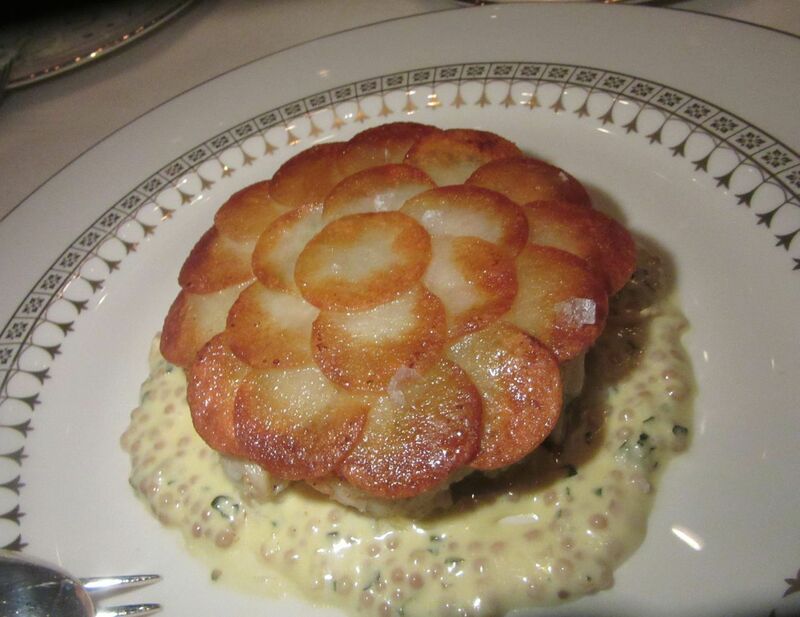 A potato mille-feuille accompanies plump seared scallops showered with fresh black truffle. 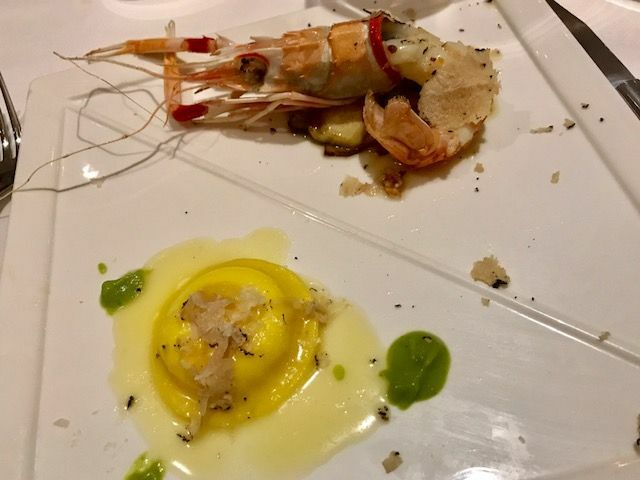 Not much appetite remains by the time a waiter trudges up the stairs with zucchini flower and king crab risotto plus a duo of secondi. But a few nibbles are rewarding. Where did the risotto go? How quickly it disappears in a whipsaw of forks. 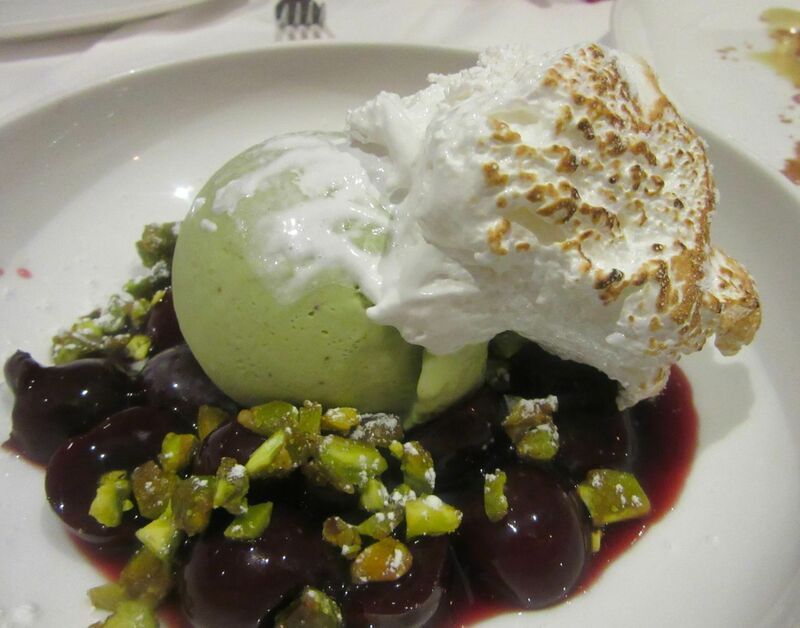 Fresh cherries infused in cherry liquor topped with pistachio gelato and a cloud of warm Italian meringue. “The special dessert tonight is cherries.” Giselle begins. “Cherries done how?” we ask. Giselle shrugs. “Cherries,” she says. “We’ll have cherries and the check,” I command, already antsy in the third hour of captivity. An old fashioned millefoglie with vanilla cream is a gift from the house. 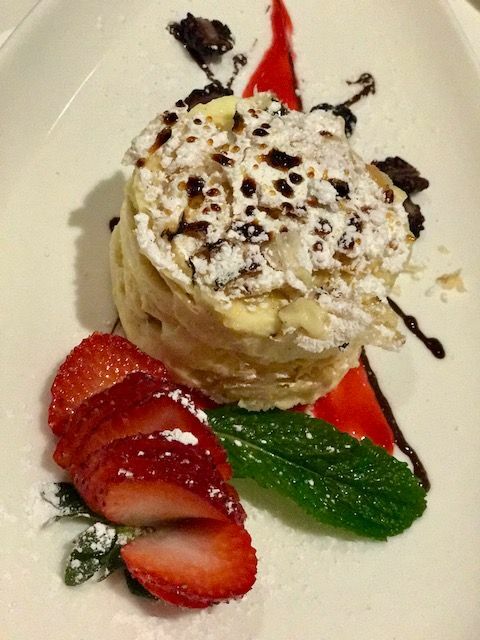 Two bussers race up the steps with a trio of desserts, green apple semifreddo on caramel streaks, millefoglie pastry discs layered with vanilla cream and pistachio gelato under warm Italian meringue like a glacier in a sea of sweet ripe cherries and their sticky boozy sauce. 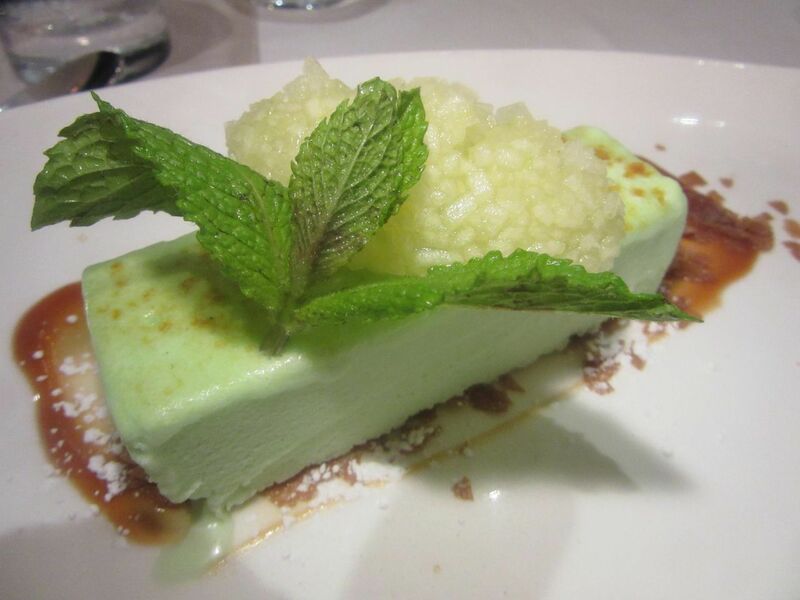 Fresh-grated green apple rides on atop the apple semifreddo on splashes of caramel. 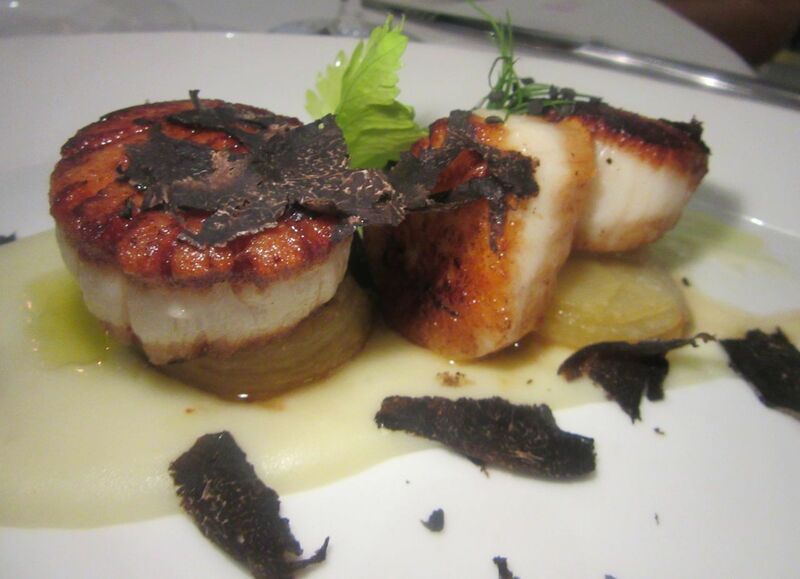 I expected a steadier flow from Chef Deiaco, previously in charge at Armani and Cipriani. Consider that he’s been in local kitchens since he arrived to stir the pots at ambitious Palio, now sadly defunct. I’m hoping Avena’s crew will shape up in time. 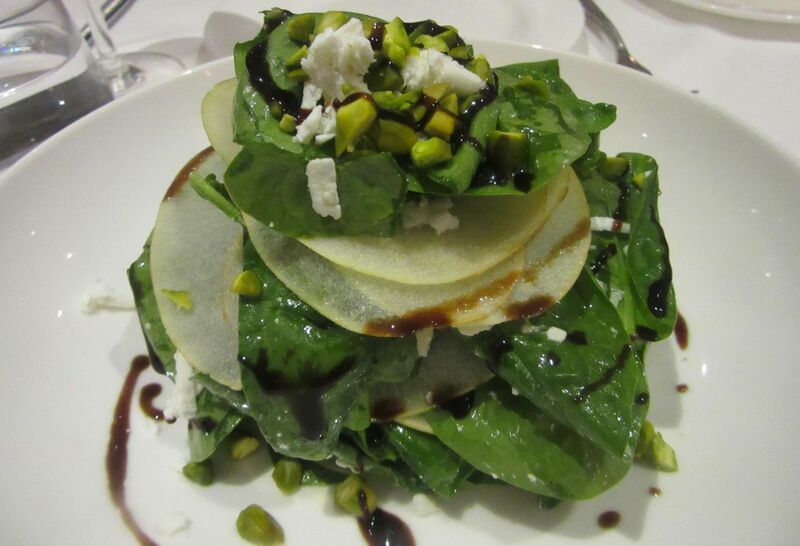 Baby spinach is layered with thin discs of raw pear, and tossed with ricotta salata and pistachios. 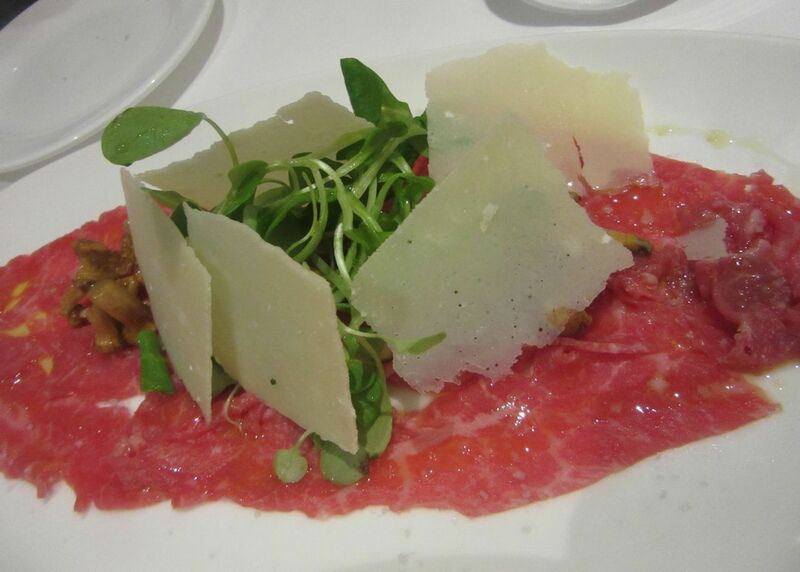 Red Angus carpaccio flanked with chanterelles with mache and parmesan in a slick of olive oil. Meanwhile, I’ll send you here because the food is mostly very good. Even a seeming predictable spinach and pear salad is special, studded with pistachios and ricotta salata. Very pretty too. 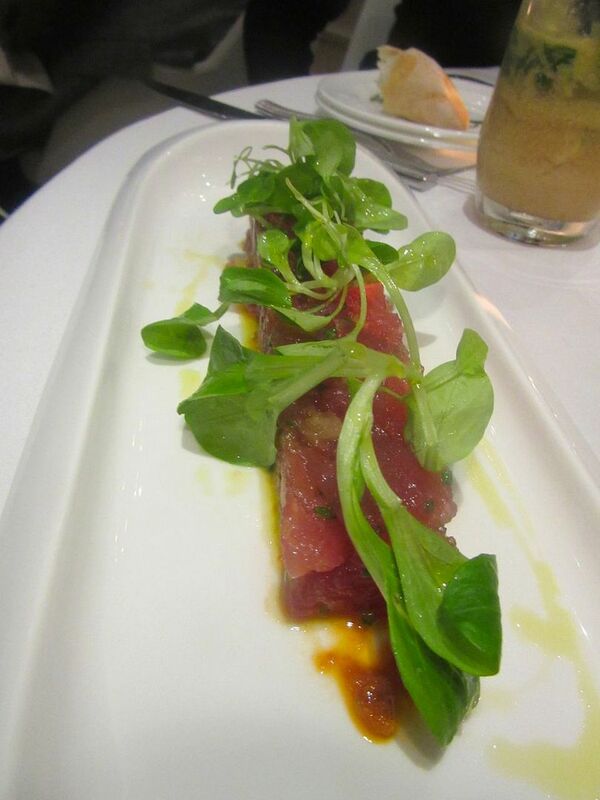 Red Angus carpaccio in a haze of that premium olive oil is another well-done standard. A second cocktail and an occasional trip to the loo will ease the blues of waiting. 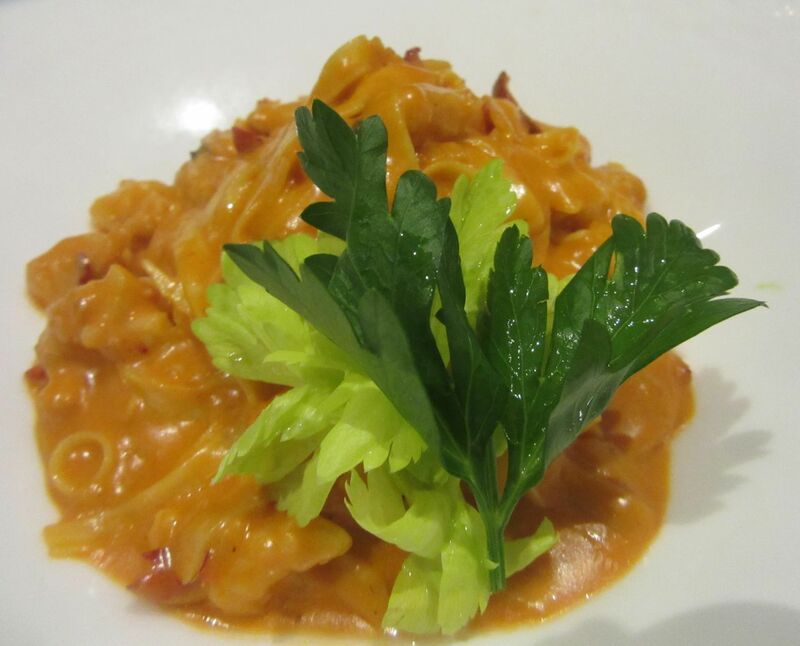 Lobster fettucine is the special of the evening. Of course, we’ll have it. As summer nights grow warmer, the perfect dinner might be vitello tonnato with thin slices of veal, citrus and a scattering of Sicilian capers or the crudo di mare trio – big eye tuna with blood orange segments, branzino tartare with olivata and that same outsize langoustine topped with green apple and sturgeon caviar. 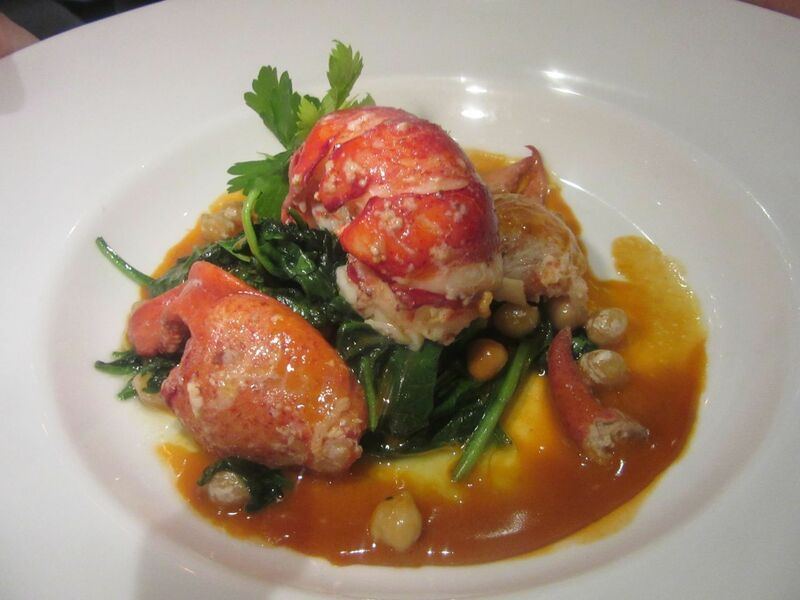 Chilled lobster caprese is served with yellow tomatoes, lettuce puree and a lemony-based vinaigrette. Our crew shares chilled lobster caprese with yellow tomatoes, lettuce purée and a lemony finish one evening, followed by pastas: The lobster fettuccine is rich enough to satisfy four, the ricotta-and-quail-egg ravioli even richer. Surrounded by so many wonderfully-prepared dishes, the fritto seems especially mundane. 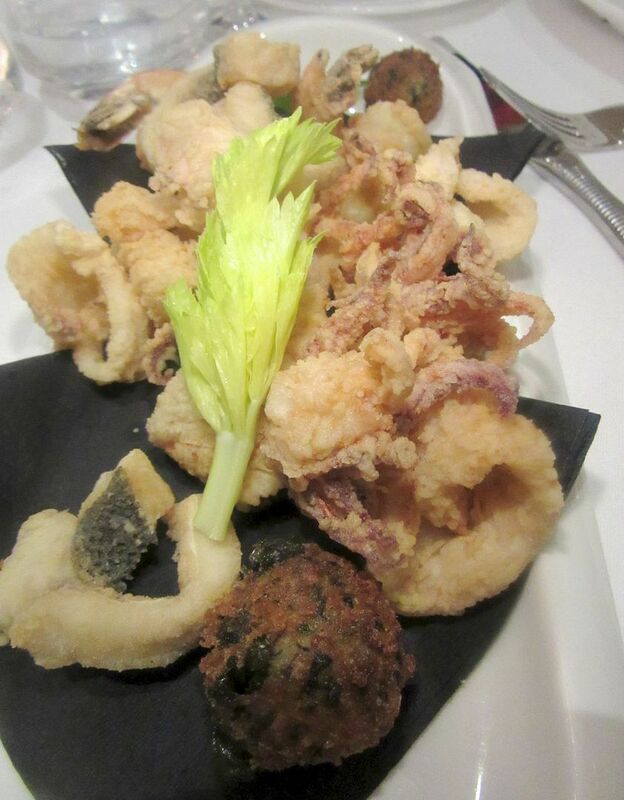 Only the seafood fritto is disappointing. It doesn’t taste freshly fried. 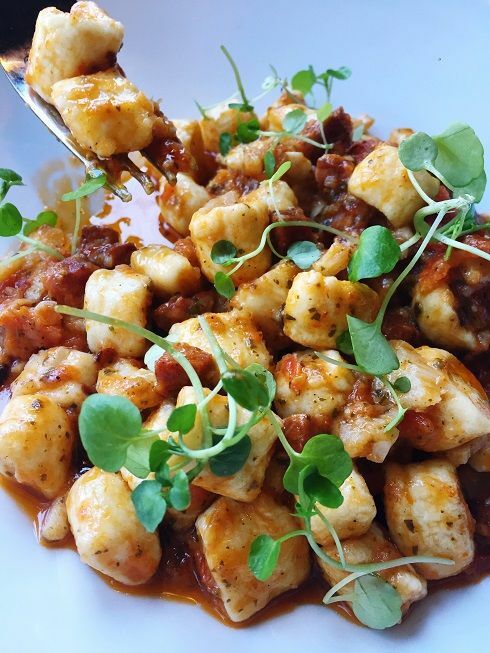 And potato gnocchi with crab seems overwhelmed by an excessively-tomatoey brandy sauce. 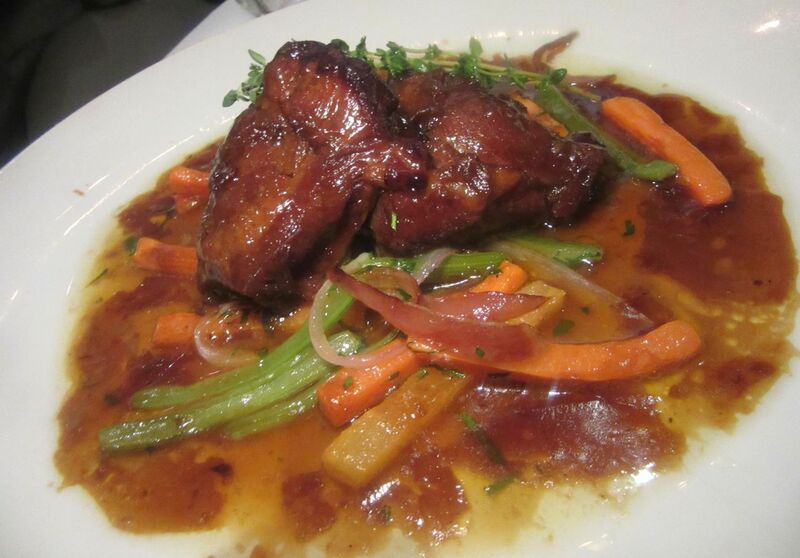 Slow-braised veal cheeks are, as expected, joyfully rich and fatty. The soft polenta is served separately. Braised veal cheeks with gremolata and a side of runny polenta are fatty and delicious. Peter insists it’s too rich to eat more than one bite, but nothing seems to be too rich for me. Perhaps the lamb loin in a Castelvetrano olive crust could be rarer. Baby artichoke halves alongside are nicely crisp. 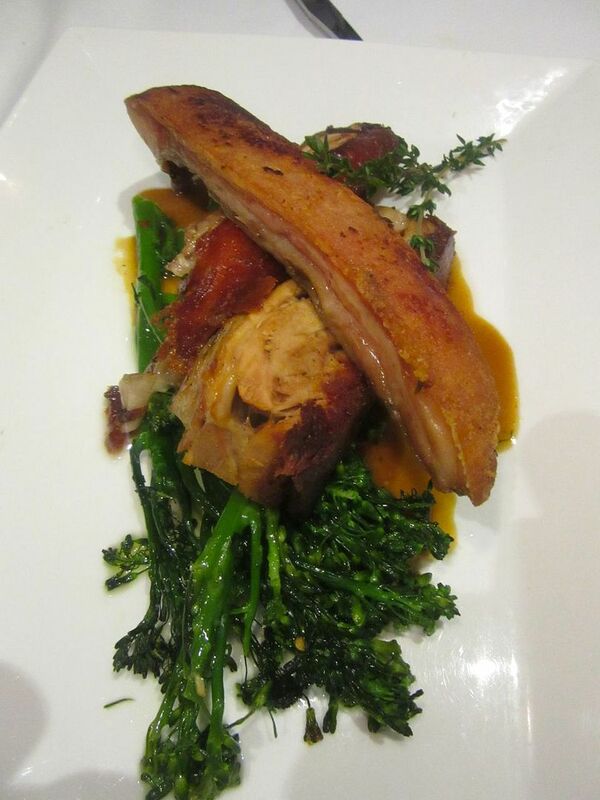 There are enough parts of suckling pig and its crispy skin with broccolini for tasting, too. 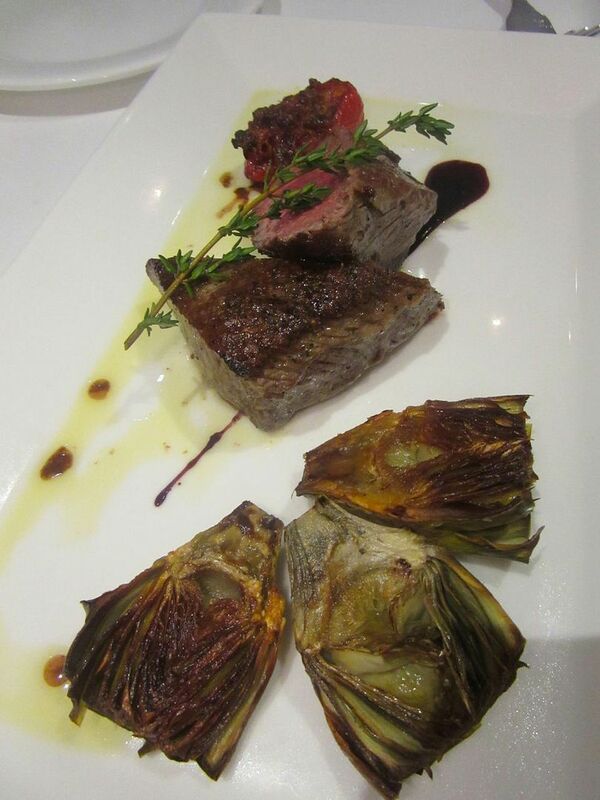 A trio of crisped artichoke halves accompany the Colorado lamb loin in an olive crust. I nurse a Primitivo from Puglia, rosé fans prefer a Tuscan rosato. With cocktails -- possibly a Sicilian Mule (pistachio-infused vodka) and a glass or two of wine priced from $13 to $25 – one dinner costs $70 a person. On another evening it runs $90 each. Still eating? Amazing, isn’t it. But the sucking pig is a must, at least for me. I like the broccolini too. I’m cheering for the Deiacos’ survival on East 57th. Do the math. If they speed up the delivery of this elegant food, they can turn more tables and hire better help. 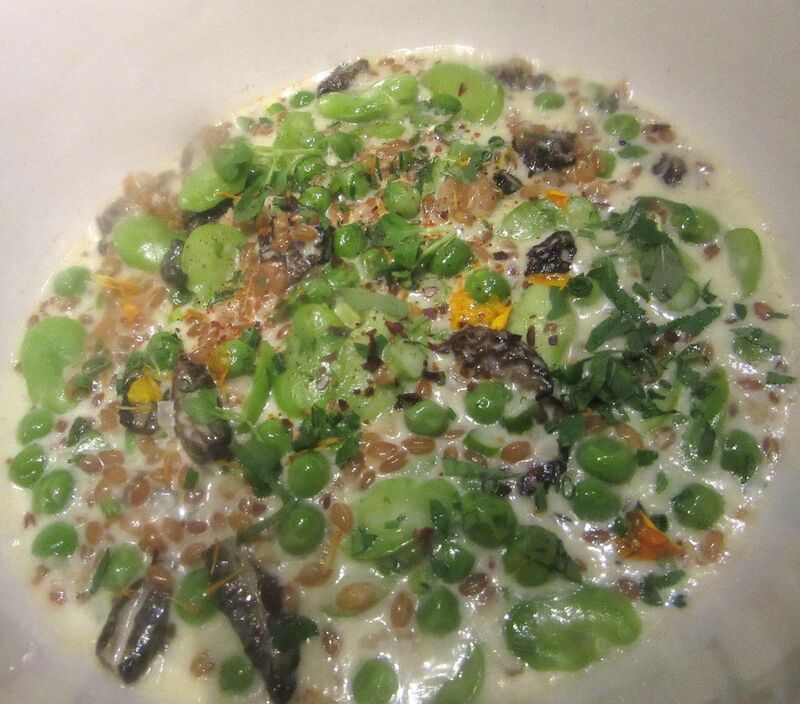 Till then, I’ll be back anyway, vying with you for a table, eager to taste dishes inspired by the summer harvest. 41 East 57th Street between Lexington and Third Avenue. Now closed.